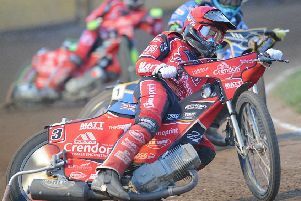 Competing in a World Championship qualifier proved to be an expensive and painful experience for Panthers rider Bradley Wilson-Dean. The New Zealand champion raced in a quarter-final at German track Abensberg on Monday. He racked up five points from three rides, but was then involved in crashes in his final two outings which left rider and machinery rather worse for wear. Wilson-Dean admitted: “Five points is two more than I managed at the same stage last year so I’ll treat that as a positive. Wilson-Dean has been passed fit to line up for Panthers at Redcar tonight when he steps into the main body of the city team after a terrific run of form at reserve in the early weeks of the season. Wilson-Dean’s Panthers team-mate Jack Holder fared better in his own international outing in Germany. Holder was part of the Australian side which won a World Under 21 Team Cup semi-final at Pocking last Saturday. Holder racked up 10 points to help the men from Down Under to victory over Great Britain and two German sides. The final is at Rybnik, in Poland, on September 2 with Holder set to miss two Panthers’ meetings that weekend.